A series of life-changing events propelled Andrew White to follow in the footsteps of his father, former Gov. Mark White, and launch his own bid for Texas' highest office. HOUSTON – Several years ago, Andrew White was at his wits' end. Fresh off selling a business he started from scratch, he began experiencing severe migraines accompanied by dizziness, ultimately going deaf in his left ear. The mysterious illness went unresolved for a year and a half, and depression set in. "I thought I was done," White said. "I thought my ability to be a productive person was over." After cycling through numerous doctors and potential remedies to no avail, he stumbled upon a simple solution from a neuroscientist online: adding a lot of salt and water to his diet, and cutting back on carbs. Miraculously, it worked, and White suddenly felt he had a new lease on life. That health crisis marked the start of an extended period of upheaval for White. Last fall, he experienced the sudden death of his father, then witnessed up close the devastation that Hurricane Harvey wrought on his native Houston. Around the same time, he was increasingly noticing Texas Democrats were struggling to recruit a serious candidate for his dad's most famous role: governor. All those loose threads pushed White into contemplating another dramatic turn in his life, this one of his own making. Since the fall, White has emerged as both a likely and an unlikely candidate — the former due to his pedigree and the latter due to his own aversion to political life, whose indignities he had seen take down his father. For years, White had built a business career of his own, all but removed from the political spotlight. Those days are long over. White is in the thick of a spirited runoff against Lupe Valdez, the former Dallas County sheriff, to take on Republican Gov. Greg Abbott, a lavishly funded and popular incumbent. With less than two weeks until the election, White also is on the precipice of a moment he has long sought in the race: a debate with Valdez, who is looking to recover from a rocky stretch of her campaign. Yet White also has something to prove: that Texas Democrats can trust a self-described “moderate” to fight for them in the David-and-Goliath battle that awaits in the fall. White, 45, insists he “never wanted to be in politics for a second,” even as he grew up surrounded by it in the Governor’s Mansion in the 1980s. 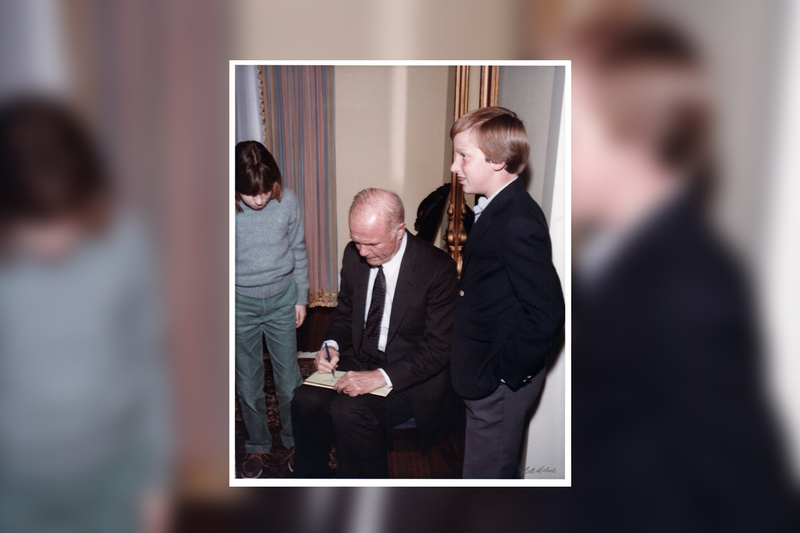 White, then in his early teens, was awed watching luminaries shuttle through the house to see his father — John Glenn one day, Prince Charles the other. What enthralled White the most, though, was quietly listening from the periphery as his dad and his advisers huddled at the mansion, plotting strategy. Still, the younger White remained uninterested in one day making a political life of his own, taking note of the toll it took on his father. That feeling was only exacerbated when his dad lost re-election in 1986, in part due to an intense backlash to the “no pass, no play” rule he championed that required public school students to pass all their classes to participate in sports. At the time, White saw his dad’s defeat as undeserved punishment for doing the right thing. The loss brought an abrupt return to reality for White, whose father had been in Texas government and politics virtually his whole life. Election nights had become something of a family ritual. Leaving the mansion behind, White’s family returned to Houston, where he graduated from Lamar High School in 1991. Determined to escape his father’s shadow, he set his sights far outside Texas. White’s mission to pave his own path led him to the University of Virginia, where he graduated in three years with a major in religious studies. Along the way, he joined the Army ROTC and a local volunteer fire department — and largely avoided politics. White supplemented his religious studies courses with a smattering of economics classes. A recruiter on the UVA campus ultimately led him to a financial analyst job in New York. He found it exciting but exhausting, and after two years on the job, he returned home to Texas. White became involved in several different business ventures — not all successful — and got married and started a family. Along the way, he got an MBA from the University of Texas at Austin. He eventually became president of Home Solutions, a fire and water damage restoration company that sent him traveling across the country to help rebuild homes after disasters. In 2005, he sold his house and put everything he had into starting his own home-warranty business. The business, Allied Home Warranty, and its sister company, Lone Star Repair, grew fast, eventually topping 200,000 clients. Houston energy giant NRG bought them in 2012 for an undisclosed price. Bryan Bledsoe, an Army veteran fresh out of college, recalled applying for a general manager position with Allied Home Warranty on Monster.com one night. Within 10 minutes, White responded inviting him to an interview. Recounting White’s leadership style, Bledsoe said he was most struck by how gracious White was, “always giving the credit to somebody else” despite how much White personally had on the line in the company. As the two worked together, Bledsoe said, White repeatedly swore off running for office one day. Bledsoe knew better. By 2013, White was about to enter a new period of life — one that would include several trying events culminating in his decision to run for governor. After selling Allied Home Warranty on the last day of 2012, White agreed to stay on for a few years and assist with the transition. But that plan was disrupted by the mysterious illness, which he now reflects on as a “mid-life physical trial,” a gut check after spending two decades grinding out a business career. Yet only a few years passed before White was tested again — this time by the unexpected death of his father, in August following a heart attack. White had to give the eulogy at the funeral, a somewhat daunting responsibility given his then-dislike of public speaking. But he was well-received, and afterward, people came up and complimented him — and suggested he may be the next politician in the family. “That certainly got the thought process going,” White said. Among the luminaries who attended the funeral was Abbott, whose wife, Cecilia, invited the White family over to the Governor’s Mansion the day after the service. It was the first time White had been back since he was a kid. He described it as “memory lane downpour.” In the private quarter, he spotted the initials that he had carved in one of the rooms as a kid. White, still reeling from his father’s death, took note of the whole experience — the funeral well-wishers, the mansion visit — but still was not seriously thinking about following in his father’s footsteps. For five days, White and his neighbors used his small fishing boat to make rescues throughout Houston, dragging dozens of people out of the floodwaters. They were not always successful — two people they rescued later died, said White, who recalled getting home those nights and struggling to sleep, the harrowing images of the day still flashing through his mind. Thinking about the leadership failures that led to the most expensive natural disaster in U.S. history stirred something in White. “He never mentioned his direct interest in political office, but it was clear that he was having some very impactful reflection during that time we were in the boat,” said David Magdol, a longtime friend of White who accompanied him for most of those days. To top it all off, White was increasingly hearing about the state party’s struggles to recruit a major candidate for governor. As White began to explore a run for governor, he got plenty of advice from his dad’s old friends and advisers. But he also reached out to others, including several former Democratic gubernatorial candidates. Tony Sanchez “treated me like his son,” White said. Chris Bell told him about how running for governor would make him a better person. Bill White emphasized the importance of data. Another Democrat, U.S. Rep. Beto O’Rourke of El Paso, gave White the same advice White’s dad had given O’Rourke about his current bid for U.S. Senate: It’s a 254-county race. The biggest reality check in those days came during White’s calls to some of the biggest Democratic donors in the state. He ended up “reliving 2014 over the phone with them,” he said, and they were “all still thinking 2014 thoughts,” reluctant to open up their wallets wide again after giving generously to Wendy Davis, only for her to lose to Abbott in a landslide. Why would White be different? 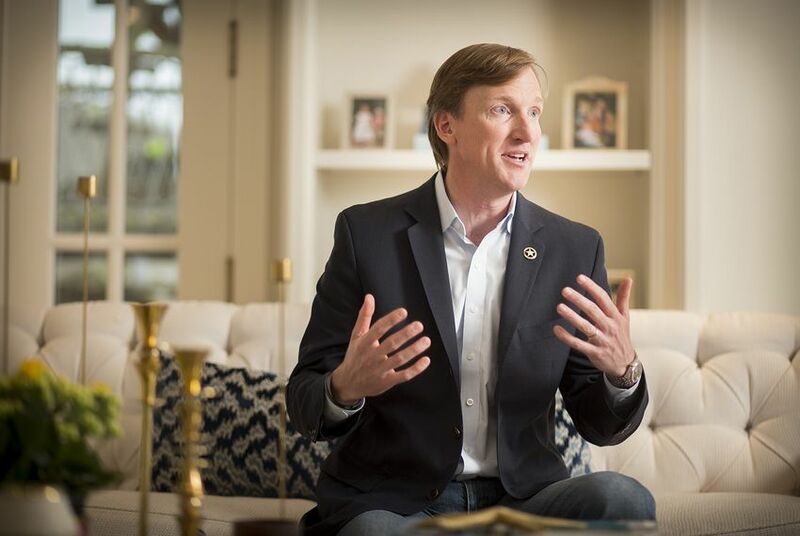 Tom Dunning, a Dallas businessman and White family friend, said his first reaction was a question: “Are you crazy?” But as Dunning heard out White, Dunning began to see a candidate he could get behind, regardless of his closeness with the elder Whites. Not every call White made during that period went well — and one in particular still haunts him. After speaking with White one day, Aimee Boone Cunningham, a major Democratic donor active in Planned Parenthood, began warning associates that White was “anti-choice” — a view amplified days later by Davis in a Facebook post. White, who disputes Cunningham’s characterization of the call, would later clarify that while he is “personally, deeply pro-life,” he respects a woman’s right to an abortion and would veto any legislation that restricts it as governor. The answer remains insufficient to some Democrats. “We don’t need somebody who is going to be anything less than a champion for women’s reproductive rights,” said Yvonne Gutierrez, executive director of Planned Parenthood Texas Votes, which has endorsed Valdez. The opening weeks of the race were sleepy. White drew some questions for having cut a $2,500 check to the Kentucky Republican Party in 2005 — a peculiar decision that he chalked up to his work as a “business owner.” But things began picking up in February as White snagged some notable endorsements, including from all the major newspaper editorial boards. Their seals of approval had always been important to his father. White also received support from less likely sources, such as the Houston GLBT Caucus. That one almost brought him to tears, he recalled, noting the obvious: He was a straight white man running against a barrier-breaking lesbian Latina sheriff, and he did not expect to earn such a group’s support. “But I care about these issues, and I wanted them to know that,” he said. It was around that time that a portrait of Valdez began to solidify: unprepared, ill-informed, untested. But White was anywhere but in the clear from his political demons, still fielding questions about his abortion stance. And by the time the primary kicked into high gear, he was getting it from both sides, too. Members of his church, Christ the King Presbyterian Church in Houston, were increasingly uneasy about his public comments on gay marriage and abortion, both opposed by the congregation. By the end of January, he stepped down as an elder in the church. White was nonetheless making progress in the primary, raising more money than any other candidate, including Valdez. He saw the need for even more, though, and loaned himself $1 million in late January, which helped allow him to spend hundreds of thousands of dollars on TV advertising in his hometown. “It was and still is a huge risk,” White said of the loan. Heading into Primary Day, White felt confident as he visited a series of polling sites with his wife. He stopped by Houston’s Mark White Elementary School — and quickly regretted it as he was overcome with emotion. On March 6, White finished with 27 percent of the vote to Valdez’s 43 percent. His TV advertising in the Houston area paid off: He carried Harris County by a wide margin in the nine-way race, getting 52 percent there. But Valdez won most other parts of the state, auguring what many viewed as a tough path ahead for White in the second round. White doesn’t buy it. He believed the runoff is a “completely different race,” and he’s confident that the less-informed voters who came out for the primary won’t return for the runoff. White kicked off the overtime period by issuing a debate challenge to Valdez, whose campaign expressed openness to it but didn’t make any commitments. He continued to beat that drum for weeks, as he rolled out jobs and education plans to limited fanfare, hoping to contrast with Valdez's vague platform. In White’s mind, a turning point came on April 29. During a town hall hosted by Jolt, a group of young Latino activists, Valdez gave a lackluster answer when asked about her record on immigration as sheriff, and Jolt endorsed White a few hours later. That led to an apology from Valdez for her answer, and days later, she agreed to debate White. The flurry of events — over the course of just a week — “blew me away,” White said. Yet White did not escape unscathed from that same event. He faced questions about a company he owned, Geovox Security, which sells technology that has been used at the border to detect people hiding in vehicles. Last week, White announced he would divest from it. It’s one of several issues that is bound to come up at Friday’s debate. For White, it is his highest-profile opportunity yet to show he is Democrats’ best choice for November — and a far cry from the years he spent resisting a political career.